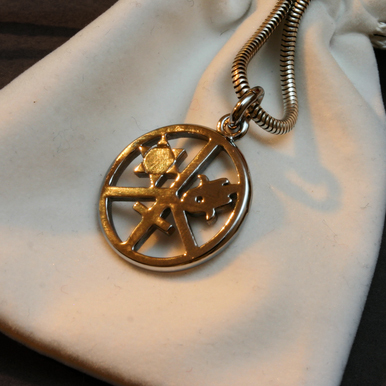 The jewellery is a peace sign, in which each of the three monotheistic religions are represented. Islam by the hand of Fatima. Christianity by the cross. And Judaism by the Star of David. Putting together Christianity, Judaism & Islam in this jewellery, is meant to express a wish and strong inclination. A wish for a world in which we can live in coexistence. A world where we strive to extend religious freedom to people of all religions, with respect and tolerance for each others' differences. The surplus goes to the Peres Center for Peace's children's-program, Saving Children, where Palestinian children are treated by Palestinian and Israeli doctors at Israeli hospitals. For further information go to www.peres-center.org.